MagicSpam can operate on any type of mail server. Requests for our MDaemon version can be done by posting to our MagicSpam Forum or contacting our sales team at sales@linuxmagic.com. 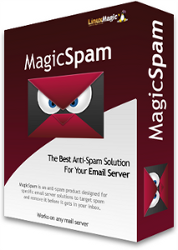 MagicSpam is an anti-spam product designed for specific email server solutions to target spam and remove it before it gets in your inbox. Please visit our Product Info page for more information about MagicSpam. Not The Platform You Want?